Some of my most valuable work will never appear on this website or in print because of the discretion and confidentiality required in working with institutions in times of transition. Below are some highlights of client work of a more public nature. 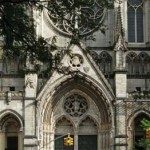 I was invited to join The Cathedral Museum of St. John the Divine, the world’s largest Gothic cathedral, as Director of Visual Arts and Director of the Museum in order to catalogue the cathedral’s vast collection of old master paintings and, in the process, start a new museum in New York. During this very vibrant time there were many artists-in-residence from many disciplines and countries as well as a major capital campaign under way to finish the building’s construction. During my tenure I researched and catalogued the art collection, established important relationships with scholars, art dealers, auction houses, fellow museum colleagues and philanthropists, curated a number of exhibitions, established a now famous onsite tapestry restoration facility, and raised the new museum’s beginning funding. I also worked very closely with one of the great New York City nonprofit boards of trustees.